In Hydroponics, fast growth and high yields are made possible by the use of concentrated minerals and micronutrients. But this success is often decided by the finest of margins. As a grower, you have to find the Goldilocks zone of nutrient strength to help your plants grow properly. If you add too many nutrients, the plants get affected by a severe case of a nutrient burn. Add too little, and they will or show stunted growth and poor flowering. But how do you prevent this from happening? If you wait until the symptoms appear, it might be too late. Prevention is better than cure in hydroponics, just as it is in the case of our health. The important thing here is to keep a strict eye on your nutrient solution. To get the complete picture, you will need to analyze certain physical and chemical properties of your nutrient solution. This is where you encounter terms like TDS, EC, and PPM. Hydroponics experts use these terms to measure and evaluate the quality of their hydroponic nutrient solutions and feeding system. What Are Totally Dissolved Solids (TDS)? Water is a called as a universal solvent, capable of dissolving a wide range or organic and inorganic compounds and minerals. TDS of water measures the total quantity of minerals dissolved in it. The solids are dissolved either as ions, molecules or tiny micro-granular particles which cannot be filtered away using ordinary filters (size of two micrometers). This measurement is usually used in the context of freshwater. For saltwater, the term "salinity" used and it basically talks about the same thing. TDS is a measure of water quality, but it is not a direct sign of pollution. It gives you an idea of the quantity of solids dissolved, not what is dissolved. All water, even drinking water, contains several minerals and compounds in the solution. Tap water contains calcium, magnesium, and of course, chlorine ions. Bottled mineral water actually contains more dissolved minerals than tap water. In the context of hydroponics, TDS gives you a clear idea of the strength or concentration of your nutrient solution. You can get accurate information regarding the amount of nutrients that your plants are getting from the water. What Is Electrical Conductivity (EC)? Water is a decent conductor of electricity, which is why a lot of shock-related accidents happen in bathrooms. But did you know that pure water is an excellent insulator?! Pure water, meaning H2O with no other minerals or molecules dissolved in it, does not conduct electrical current. But once mineral salts start getting dissolved in it, electrical properties of water change drastically. And due to the highly corrosive nature of water, it readily dissolves a lot of minerals, salts, and compounds. This is why all water found in our surroundings turn out to be good conductors of electric current. Salts form charged particles, called ions, in water. These include positively charged cations (made from metals) and negatively charged anions (made up of non-metals). Even a small quantity of dissolved salts is enough to raise the electrical conductivity of water drastically. And the higher the quantity of salts dissolved in it, the higher the number of ions, and higher the electrical conductivity of water as well. How does this affect hydroponics? Well, a vast majority of nutrients used in hydroponics involve salts like nitrates and phosphates. So adding nutrients increases the EC of the water. If you get the measurement of EC, you can get a pretty good idea regarding the levels of nutrient concentration in your water. EC is measured using two connected units. These are milliSiemens and microSiemens. For reference, 1 milliSiemens = 1000 microSiemens. We have already mentioned ppm while explaining TDS. In chemistry, ppm is a common value used to denote the substances dissolved in minute quantities in air, water, and soil. PPM is basically analogous to the percentage. Just as one percent means one in hundred, one ppm is equal to one in one million parts of something. You will often see ppm used to measure pollution levels in water and air. PPM is easier to understand when using the metric system. 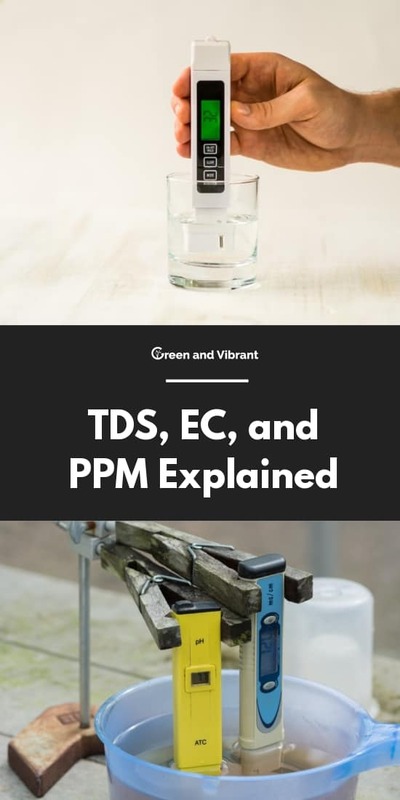 What Is The Relationship Between TDS & EC? As you know by now, TDS gives you an accurate idea of the amount of solids dissolved in a water sample. And EC gives you a clear picture of the concentration of salts in a water sample. Out in the environment, there is often only a partial connection between Electrical Conductivity and TDS. But ina hydroponic grow system, the relationship is more direct for several reasons. Take the water in a lake or well for instance. It will contain a significant amount of dissolved minerals, salts and other organic and inorganic compounds. Only a fraction of the total TDS, namely salts, affect the EC. But hydroponic growers try to use a higher quality of water for their crops whenever possible. And almost all the ingredients in hydroponic nutrient mixes are in the form of easily soluble salts. So, in a hydroponic nutrient solution, the EC and TDS values have a more direct correlation, due to the high percentage of dissolved salts. Your main objective as a grower is to get an accurate assessment of the concentration of your nutrient solution. Both TDS and EC are viable routes to getting this information. In fact, if you have one value, you can calculate the other using something called a conversion factor. All salts do not have the same electrical conductivity. If one salt raises the EC of the water by one microSiemens at a TDS of 1500ppm, another salt may only need 1000ppm to achieve the same result. Another important factor that can affect the above equation is the temperature of the water. The EC of a salt solution can fluctuate with changes in temperature. The higher the temperature, the better the electrical conductivity. There are several ways to measure both TDS and EC. 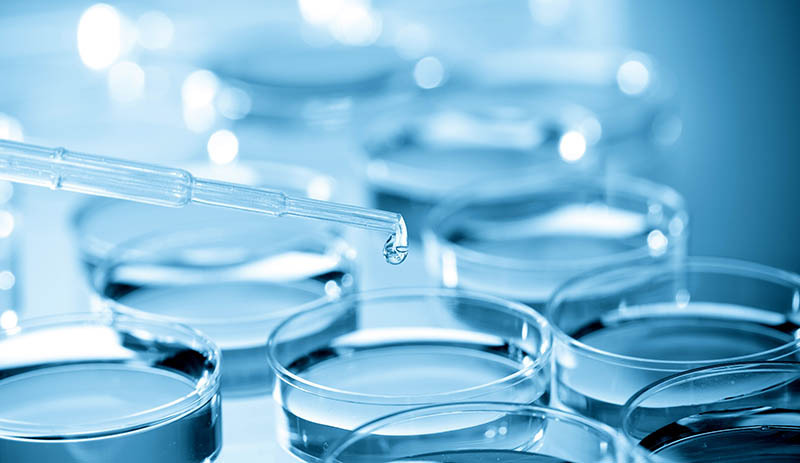 For instance, one method often used in labs is to evaporate the liquid and then measure the residue. But from the perspective of the average hydroponics grower/hobbyist, advanced lab-based measurements are not applicable. Instead, most growers use simple handheld meters to measure either TDS or EC. You can either use an EC meter or a TDS meter. In fact, a TDS meter is nothing but an EC meter which has a built-in conversion system. That system is programmed to use a set ke factor to give you the result in ppm or mg/L, instead of in milliSiemens. But here in lies a fundamental problem: Some TDS meters use 442 conversion factor, which is the EC rate for a mix of 4 parts sodium sulfate, 4 parts sodium bicarbonate, and 2 parts sodium chloride. The formula for conversion is 700 x EC in milliSiemens. Others use a straightforward Sodium Chloride conversion factor, which is considered by some to be closer to the EC of a hydroponic mix. The formula here is 500 x EC in millisiemens. So depending on the conversion factor used, you will get different results, with a divergence of around 600ppm. That is a huge margin for hydroponics. So how do you know if you have the accurate measurement? The simplest thing to do is to stick with EC measurements. But if you must use TDS, check the source of information. If a book or a nutrient mix guideline states the PPM, it will usually mention the conversion factor used as well. Use this information to calculate the final accurate value. In the US, 500 or 650 ke is more commonly used, while in UK and Europe, they tend to prefer 700 ke. Measuring, calculating and arriving at the correct EC or TDS is the hard part. Managing their levels is deceptively simple! The main thing to aim for is the recommended nutrient levels, either in milliSiemens or PPM. If you are using a commercial nutrient mix, this will be mentioned clearly on the label. If the EC is too low, add more nutrients, and if it is higher than the recommended levels, add more water. That is all there is to it. Just remember that these are concentrated mixes, and that a little amount will often suffice. But with some practice, you will soon get the hang of it. Different hydroponic plants have various levels of PPM measure. You can find below the PPM chart of some popular vegetables. However, the fact is the PPM level above only tells you the general status of your nutrient solution. It doesn't tell you the specific mineral ppm in the nutrient solution. Again, each plant needs different specific mineral ppms. Let's have a look at the recommended major elements concentrations in nutrient solutions by Crop. Source: Schon, M., 1992, in Proceedings of the 13th Annual Conference on Hydroponics, Hydroponic Society of America, ed. D. Shact, 1992, Hydroponic Society of America, ed. San Ramon, CA. So knowing the ppm of each mineral in the solution is the most accurate way to pinpoint your nutrient solution quality. But it requires a detailed test, which doesn't come at a cheap price and must take some time. That's why it should be done on a commercial production. For hobbyists, it's not convenient and cost-effective. People often measure the ppm of nutrient solution and watch the status of the water, and the plants to guess what nutrients plants are in need of. Then they will add the respective minerals. Every hydroponic grower should have an EC/TDS meter. This takes the guesswork out of the critical process of feeding your plants. For a beginner, EC and TDS may seem overly complicated. But once you get the hang of the basics, you will see that it is simpler than it looks. The main confusion arises from the different conversion factors involved. Unfortunately, nothing much can be done about that, since different salts have different conversion factors. If you want the most accurate measurements, as in when dealing with advanced or experimental grow systems, you will have to go for a lab testing to get the level of accuracy you need. But for beginners and hobby growers, EC meters are more than enough.